Chris Nelson on top of St Andrew’s Church tower. Photos: Alex Rea. 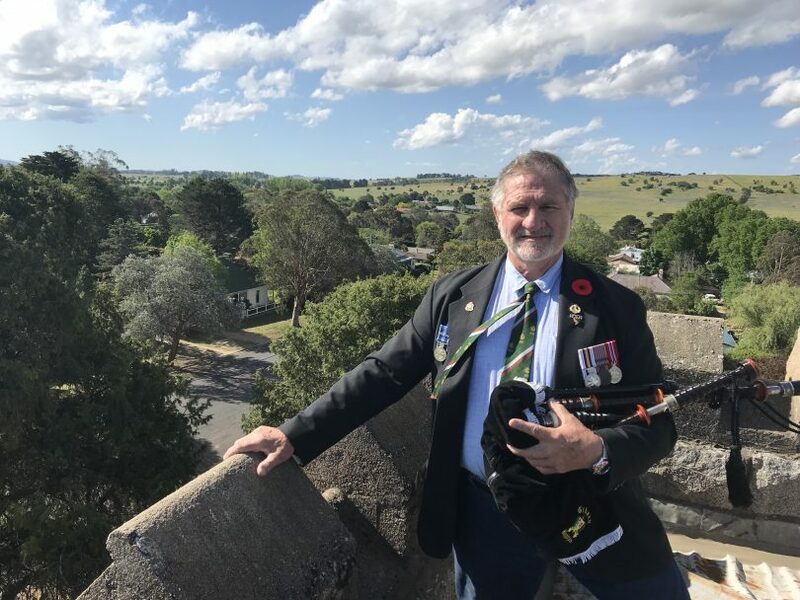 As part of a world-wide simultaneous tribute to the centenary of Armistice Day, Braidwood’s Chris Nelson played the old pipe tune “When the battles O’er” from the tower of St Andrew’s Anglican Church. Around 2000 pipers participated in the international commemoration marking the end of World War One. The Australian participation at 5 pm (Australian Eastern Summer Time), coincided with the exact time the Armistice was signed, linking simultaneously with performances of the famous tune in Britain, Europe and many Commonwealth countries. A member of the Braidwood RSL Sub-Branch, Mr Nelson served in the RAR 8th and 8/9 Battalions in the 1970s, where he learned to play the bagpipes. 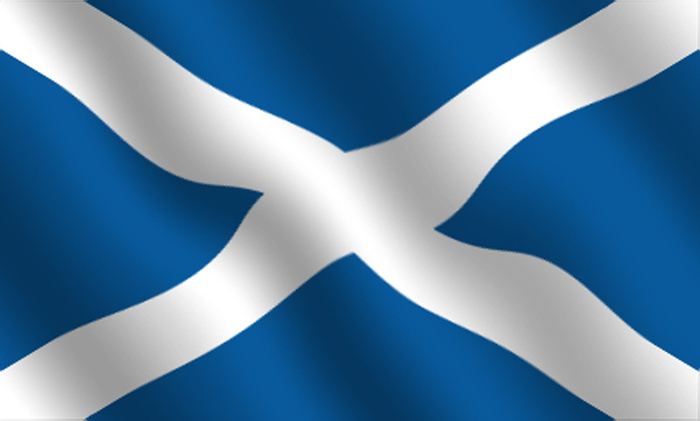 In 1980 he joined the Royal Scots in Scotland and played in the Edinburgh Tattoo in 1980. 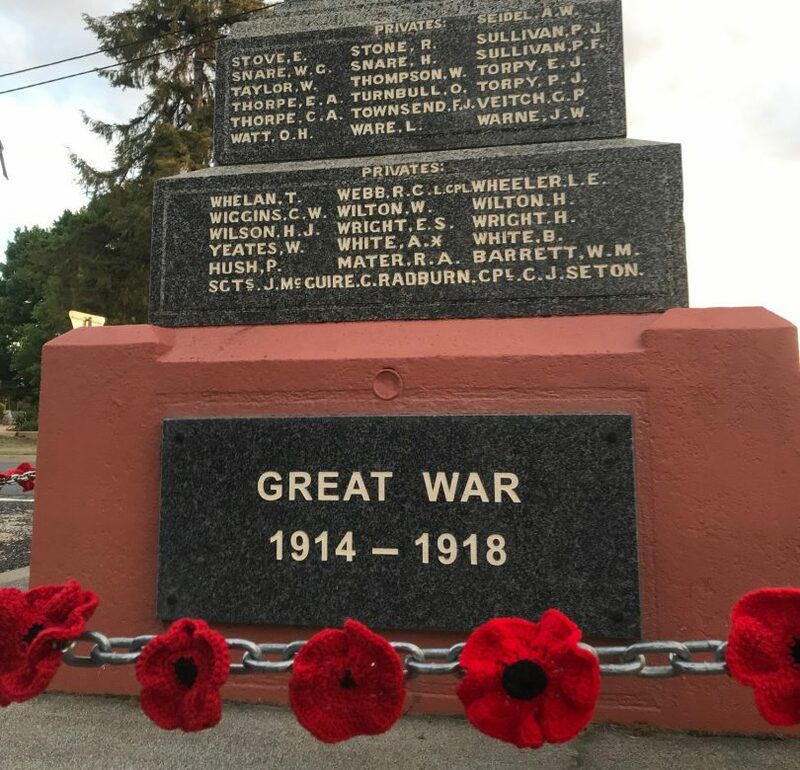 The Braidwood CWA made 88 crocheted poppies to surround the monument. 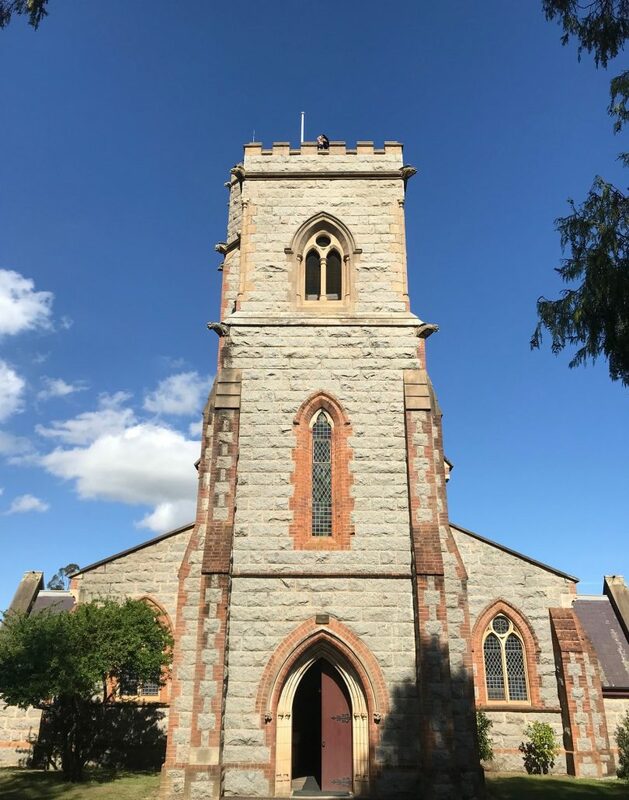 St Andrew’s Anglican Church Braidwood. Braidwood lost 88 sons in the Great War. At 11 am, around 200 people assembled at the memorial garden in Ryrie Park for a commemoration service. The Braidwood CWA made 88 crocheted poppies to surround the monument. The 11 am commemoration service at Ryrie Park. The lyrics to the popular tune by Andy Stewart were written in 1961. Where the green grasses and flowers grow. There is peace where there once was war. Sleep in peace, now the battle’s over. Where the cool waters gently flow. For those brave lads of long ago. As their banners of long ago. Stepping lightly to meet the foe. To their loved ones who held them dear. And were left to their resting here.